Rodrigues (French: ) is an autonomous outer island of the Republic of Mauritius in the Indian Ocean, about 560 kilometres (350 mi) east of Mauritius. It is part of the Mascarene Islands which include Mauritius and Réunion. It is of volcanic origin surrounded by coral reef, and just off its coast lie some tiny uninhabited islands. The island used to be the tenth District of Mauritius, it gained autonomous status on 10 December 2002, and it is governed by the Rodrigues Regional Assembly. The capital of the island is Port Mathurin. Its inhabitants are Mauritian citizens. As of 2014, the islands population was about 41,669, according to Statistics Mauritius. Most of the inhabitants are of mixed African and French descent. Its economy is based mainly on fishing, farming, handicraft and a developing tourism sector. The island (together with Agelaga and Saint Brandon) forms part of the larger territory of the Republic of Mauritius with the President as head of state and the Chief Commissioner as head of government. The island was named after the Portuguese explorer D. Diogo Rodrigues in February 1528. Many maps also describe it as Diego Roiz. From the 10th century, Arabs have been known to visit the Mascarene Islands. A 12th-century map by the Arab geographer Ash-Sharif al-Idrisi supposedly contains them, and the Cantino planisphere of c.1500 and some other contemporary maps clearly show the three islands of the Mascarenes as Dina Arobi (or Harobi), Dina Margabin and Dina Moraze. These are apparently corrupted transliterations or transcriptions of the Arabic ???? ????? Diva Harab ("Desert Island"), ???? ?????? Diva Maghrebin ("Western Island") and ???? ?????? Diva Mashriq ("Eastern Island"). 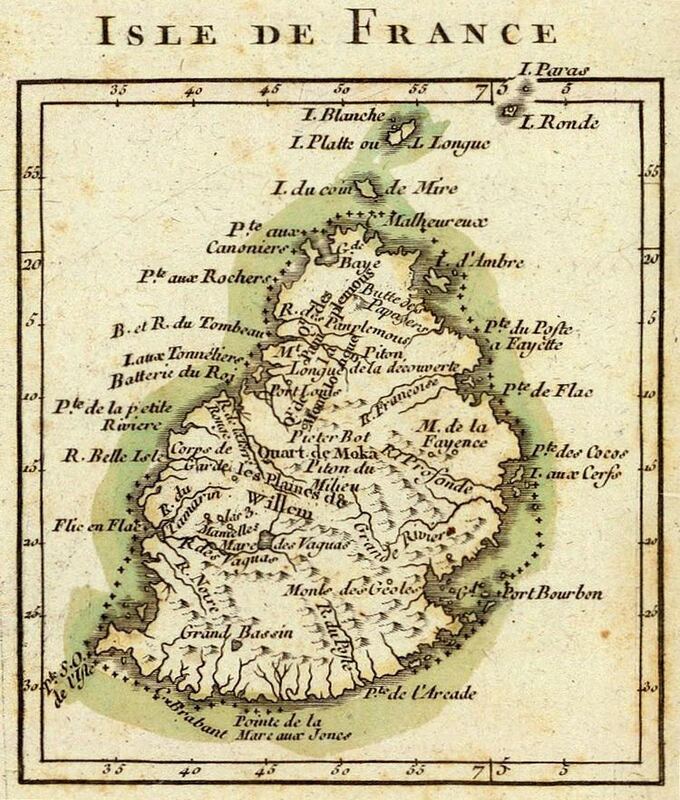 While the second clearly refers to Réunion, sources disagree about which of the other is Mauritius and which one Rodrigues, which are both to the east of Réunion and arranged in a somewhat stylised way on these maps. However, even in its original state, Rodrigues had some karst, while Mauritius even after suffering 500 years of deforestation can by no means be called "desert" even in a colloquial sense. The island was located again in February 1507. Part of the fleet of Afonso de Albuquerque and Tristão da Cunha, Diogo Fernandes Pereiras Cirne spotted Réunion on 9 February after a cyclone diverted their course. The other two islands were subsequently rediscovered. The initial name was Diogo Fernandes; Domingo Froiz was given as a name some years later, and by 1528 it had been again renamed after the Portuguese navigator D. Diogo Rodrigues and has remained so since. The orthography has been less stable at first, with the name being transcribed Diogo Rodriguez (Spanish maps), Diego Roiz, Diego Ruys (Dutch maps) (or even "Diego Ruys Island"), Dygarroys or Bygarroys. Some early French sources called it Île Marianne. Due to the island lying far off the beaten track of seafarers at that time, it received few visits. From 1601, the Dutch began visiting the island somewhat more regularly for fresh supplies of food. In 1691 the Huguenot François Leguat and seven companions landed on the island, intending to set up a farming colony of Protestant refugees. Farming was not successful, but there was an abundance of tortoises, turtles, birds, fish and other seafood. During the 18th century several attempts were made by the French to develop the island. African slaves (ancestors of the present population) were brought to Rodrigues to develop stockbreeding and farming. In 1809, after a brief battle with the French, British troops took possession of Rodrigues. And with British occupation, slavery was abolished. In 1883, the eruption of the Indonesian volcano Krakatoa was heard at Rodrigues Island and it remains the furthest point at almost 4800 km, at which the explosion was heard. The sound was described as "the roar of heavy guns". Naval ships were ordered to investigate as it was feared the sound was due to a ship in distress firing its guns. Having been heard from about 5000 km (3000 mi) away on the other side of the Indian Ocean, the noise remains the loudest sound in recorded history. In 1968, Rodrigues was joined with Mauritius when it attained independence; today it is an autonomous region of Mauritius. In 2002, the island was made the seat of the Roman Catholic Vicariate Apostolic of Rodrigues. Rodrigues is a volcanic island rising from a ridge along the edge of the Mascarene Plateau. The tectonically active Rodrigues Triple Point lies on the seafloor nearby. Rodrigues is only 1.5 million years old, even if the plateau under the lagoon surrounding Rodrigues may be much more ancient than the island. Over time Rodrigues has developed a unique environment, including many endemic species. Rodrigues is situated about 560 km (350 mi) kilometres to the east of Mauritius. It is about 18 km (11 mi) long and 6.5 km (4.0 mi) wide with an area of 108 km2 (42 sq mi). The shape is that of a whale back with a central ridge and deep cut valleys. The island is hilly with a central spine culminating in the highest peak, Mountain Limon at 398 m (1,306 ft). Rodrigues is the only Mascarene island with extensive limestone deposits and caves. A large fringing reef surrounds the island forming a lagoon within which lie eighteen small islets. The coral reef of Rodrigues is of particular interest as it is self-seeding – it receives no coral zooplankton from elsewhere. This has led to an overall species-poor but highly adapted ecosystem. A species of coral, two species of Pomacentrus damselfish and many species of crustaceans are only found on Rodrigues reefs. The economy of Rodrigues is mostly dependent upon Mauritius. The main sources of income and economic activity are tourism, fishing, cultivation of vegetables (especially of onions, garlic and chili), and animal rearing. The handicraft industry has proven to be beneficial to the economy of the island. However, the income derived from the export of sea products, cattle, and food crops is smaller than the costs of imported products, creating a deficit. The traditional music of the island is known as Sega Tambour. The music has an accentuated beat, usually accompanied by an accordion, clapping and the use of improvised percussion instruments like bamboo. The folk dance music is similar to polkas, quadrilles, waltzes and Scottish reels. Rodrigues cuisine consists of dishes from local products: fruit, vegetables, seafood (fish, octopus, crab, shrimp, lobster) and meat. National dishes include sausages with kreolin?s, rougaille sauce, octopus with curry, Azim salad and Rodrigues cake.